Budgies, also known as parakeets, need daily exercise. Flying and stretching their wings in flight cages provide health benefits such as coordination, balance, timing, strengthening of muscles, skeletal structure and proper function of the heart. Entrapment inside of a small cage for long periods of time can cause boredom, aggression, depression, excessive preening and self-mutilation. Determine the size of the flight cage. Locate a space where the flight cage will stand and take proper measurements to assure a good fit into the space. Cut the bamboo wood to size using a hand saw. Clean straight edges are recommended. File down any wood fragments with sandpaper. Drill and screw the wood pieces together, creating a total of six frames. The six frames are for the front, back, bottom, top and sides. Create a seventh smaller frame for the door to the flight cage. Make the door large enough that your hand, dishes, toys and the budgie fit through it easily. Cut the mesh wire panels to size using the wire cutters. Use the shape and size of the wood frame to determine the size the mesh wire should be. The wire panel edge should rest in the center of the wood frame. The wire edges should not exceed the bamboo board. Place one piece of mesh wire on top of one wood frame. Hold it securely in place. Attach the wire mesh to the wood by using large staples and an industrial staple gun. Repeat this step for all of the frames. Determine the location for the door to the flight cage. Use the small wood frame that was created earlier as a guide for how much wire mesh needs to be removed from the area where the door will be placed. Remove the mesh wire by using wire clippers. Adhere the wood frame to the remaining mesh wire with staples. This will create an open door. Cut small pieces of wood and create a square door frame. The size of the door frame will fit perfectly inside of the larger door frame that already is attached to the flight cage. Attach two hinges to the original door frame. This will result in a swinging door. Attach a small door latch to secure the door in place when needed. This will prevent the birds from escaping through the open door. Drill and screw the wood frames together creating a large square. Place the screws at the top and bottom of the wood frames located on all corners of the cage. This will create a secure and strong flight cage.  Hardware stores provide wood cutting services.  Always use wood that is safe for birds. 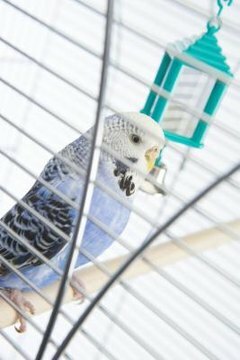  Provide food and toys in the flight cage, but do not block open flying space. ⚠ Sharp edges from the wire mesh can result in injury to hands, arms, legs and face. ⚠ Saw dust from wood can get into eyes, protective goggles are recommended. ⚠ Staples can become loose, hammering in the remaining part of the staple is required.